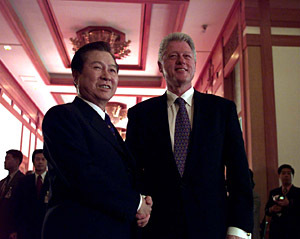 President Kim Dae-Jung of Korea greets President Bill Clinton at Chong Wa Dae. Photo by Sharon Farmer. 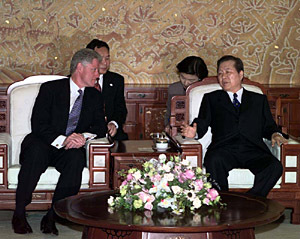 President Clinton and President Kim Dae-Jung of Korea discuss issues during a bilateral meeting at Chong Wa Dae. Photo by Sharon Farmer. 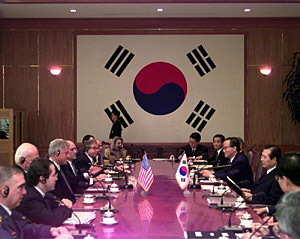 President Clinton and President Kim Dae-Jung attend an expanded bilateral meeting at the Jiphyun Room at Chong Wa Dae. Photo by Sharon Farmer. 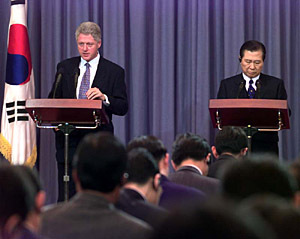 President Clinton and President Kim Dae-Jung conduct a joint press conference at Chong Wa Dae. Photo by Sharon Farmer. President Clinton and Ambassador Bosworth participate in a roundtable discussion at the National Folk Musem. Photo by Ralph Alswang. 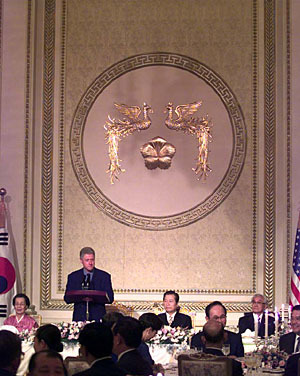 President Clinton makes remarks during dinner at the State Banq uet Room at Chong Wa Dae. Photo by Sharon Farmer.